I remember way back when on a lazy Sunday morning my then husband spoiled me with breakfast in bed. He had added corn to the pancakes to which I turned up my "fussy pants" nose. Little did I know that this basic recipe would start a life long love affair for corn in my pancakes that follows me to this day. The recipe below is a little more sophisticated than that first encounter with the addition of cornmeal and a topping of blueberry sauce but there is nothing as satisfying on a cool Sunday morning than a beloved recipe. Corn is in season here from July through September but is at its peak in late summer. Adding sweet corn this time of year is totally the right move! These pancakes have a great texture, flavour and have a picture perfect presentation. The cornmeal in these pancakes helps create a nice almost crisp outside with a soft inside. When we have a chance, we'll make them with freshly ground cornmeal bought at local festivals or at our organic grocers. Maybe if my then husband had have served THESE pancakes in bed we would still be married. Or if I made them for him. Smile. For the pancake batter: In a large nonstick skillet, melt the butter over medium heat. Add in the corn kernels and sauté until just starting to brown, about 4 minutes. Toss in a pinch of salt, stir and remove to a bowl to cool, reserving pan. In a medium bowl combine flour, cornmeal, baking powder, baking soda, sugar, salt, and lemon zest. In a separate bowl, whisk together the milk, egg, and cooled corn kernels. Pour liquid into the dry ingredients, and mix until just combined. Add the melted butter and mix again until just combined. The batter should be thicker than your average pancake batter, but feel free to add a few extra tablespoons of milk if it looks way too thick. Set aside while you make the blueberry sauce. To make the blueberry sauce: To a medium sized saucepan add 2 cups of the blueberries, lemon juice, water, and maple syrup. Bring to a simmer, stir in cornstarch mixture, and simmer until sauce is thickened, approximately 5 minutes. Remove from heat and stir in remaining cup of blueberries. Now it's time to make the pancakes! Heat a large pan, griddle, or skillet over medium heat. Drop in a pat of butter and swirl it around to melt. Ladle 1/4 cup of the pancake batter in and smooth the top. When small bubbles appear flip your pancakes and cook until browned. Remove to a cookie sheet in a single layer in a 200F oven until ready to serve. Add another pat of butter, and repeat! Top with blueberry sauce and enjoy! You are reading this post on More Than Burnt Toast at http://morethanburnttoast.blogspot.com. Excerpts and links may be used, provided that full and clear credit is given to the author/owner of More Than Burnt Toast. All rights reserved by Valerie Harrison. Wonderful pancakes! I really love that luscious blueberry sauce. What an absolutely gorgeous stack of pancakes Val. Cornmeal pancakes are a tradition in our family that goes back generations. Love how you've topped them with sweet lemon blueberries. It doesn't get any better than this. Such apretty blue and white vignette! 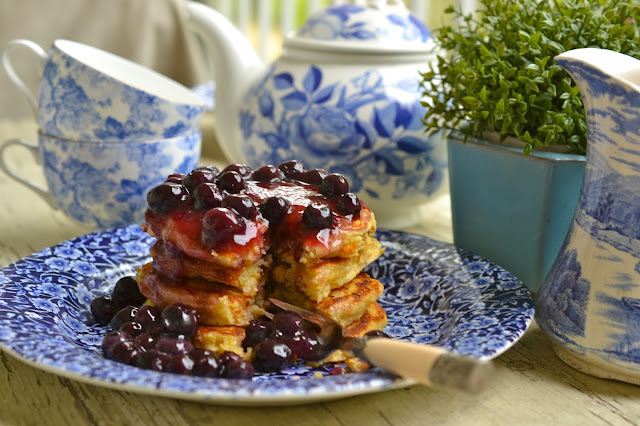 I love corn pancakes and I bet that blueberry sauce brings them to a whole new flavor level!! Those look delicious. They make me think of Little House on the Prairie days, when corn cakes were common, and blueberry syrup a possibility. Can't wait to try this recipe. I have never had these, but I really want to give them a try since I love corn and the blueberries kind of takes it over the top. Yum! This is what I want for breakfast! great recipe, val! i like a change from the buttermilk pancake from time to time! Pancakes are always such a treat for breakfast, love this sauce.